TO LAND ON the Moon, as China’s Chang’e -4 spacecraft did on January 3rd, is not quite the pinnacle of achievement it once was. Both the Indian government and a well-backed Israeli team of enthusiasts will attempt landings there this year; in 2020 various American companies intend to light out for the lunar provinces, too. But all these non-Chinese efforts will land on the Moon’s Earth-facing near side, and thus within the solicitous sight of Earthbound controllers—just as all previous lunar landings, whether American, Soviet or, since 2013, Chinese, have been. Chang’e-4’s landing site in Von Kármán crater, though, is on the far side of the Moon, where the spacecraft can no more easily be reached by radio than it can be seen through a telescope. Landing there and getting data back afterwards is possible only with the help of a cunningly pre-positioned relay satellite. Other countries have considered such missions, but none has ever mounted one. China has been carefully building up the capacity to go where they have not; now it has done so. The huge hopes China has for science have prompted huge expenditure. Chinese spending on R&D grew tenfold between 2000 and 2016 (see chart 1). This open chequebook has bought a lot of glitzy kit. Somewhere in the Haidian district of Beijing, which houses the Ministry of Science and Technology as well as Tsinghua and Peking Universities, it seems there is a civil servant quietly ticking things off a list of scientific status symbols. Human space flight? Tick. Vast genome-sequencing facilities? Tick. Fleet of research vessels? Tick. World’s largest radio telescope? Tick. Climate researchers drilling cores deep into the Antarctic icecap? Tick. World’s most powerful supercomputer? Tick (erased when America regained its lead, but watch this space). Underground neutrino and dark-matter detectors? Tick and tick. World’s largest particle accelerator? The pencil is hovering. The spree is tellingly reminiscent of the golden years of “big science” in post-war America. Between the International Geophysical Year of 1957 and the cancellation of the Superconducting Super Collider (SSC) in 1993, America’s government unfailingly invested ever more of the resources of an ever more powerful economy into the things which the leaders of its scientific community most wanted. From the creation of quarks to the cloning of genes to the netting of Nobel prizes, American science came to dominate the world. Over those 40 years America—and, to a lesser extent, Europe—were doing things that had never been done before. They opened up whole new fields of knowledge such as high-energy astrophysics and molecular biology. Benefiting from the biggest and best-educated native generations ever produced, they also welcomed in the brightest from around the world. And they did so in a culture dedicated to free inquiry, one keenly differentiated from the communist culture of the Soviet bloc. Measured against that boom—one of the most impressive periods of scientific achievement in human history—China’s new hardware, grand as it often is, falls a bit short. It has been catching up, not forging ahead. It has not been a beacon for scientists elsewhere. And far from benefiting from a culture of free inquiry, Chinese science takes place under the beady eye of a Communist Party and government which want the fruits of science but are not always comfortable about the untrammelled flow of information and the spirit of doubt and critical scepticism from which they normally grow. America’s science boom had a firm institutional and ideological foundation. It grew out of the great research universities that came into their own in the first half of the 20th century, and whose intellectual freedom had attracted extraordinary talents threatened by regimes elsewhere, including Albert Einstein, Enrico Fermi and indeed Theodore von Kármán, the Hungarian-born aeronautical engineer in whose honour Chang’e-4’s new home is named. China has imported ideas and approaches more than people and ideals. The resultant set-up has the ricketiness often seen in structures ordained from the top down rather than built from the bottom up. Top-down ambition can mean running before you walk. Take FAST, the Five-hundred-metre Aperture Spherical Telescope, which opened in 2016. Built in a natural basin in Guizhou province, it is more than twice the size of the world’s next-largest radio telescope, in America. But FAST does not have a director. Having leapt from nowhere to the top of the tree in terms of hardware, the country finds itself in the embarrassing position of having no radio-astronomer to hand who combines the scientific and administrative skills needed to run the thing. Nor, so far, has it been able to recruit a qualified foreigner willing to live in the telescope’s remote location. Self-defeating shortcuts, symbolic and otherwise, are not only the preserve of the government; Chinese scientists are prey to such temptations, too. China is not only recapitulating American science’s cold-war national-prestige boom. It is doing so in the context of the subsequent high-technology era in which no American university feels complete without a symbiotic microbiome of venture capitalists pullulating across its skin. The economic benefits of research have increasingly come to be seen as a possible boon to the researcher, as well as to society at large. For a particularly egregious example, consider the most notable Chinese scientific first of 2018. He Jiankui looked like the model of a modern Chinese scientist. He was educated at the University of Science and Technology of China (USTC) in Hefei. He went on to equally prestigious American universities, Rice and Stanford. He was brought back by the government’s “Thousand Talents” programme to a new position at the Southern University of Science and Technology in Shenzhen. Once established there, he took unpaid leave to start an entrepreneurial project. That project was editing the DNA of embryos that would then grow up into human beings. Its result was two baby girls. They do not, as yet, appear unhealthy. Nor, though, have they been provided with the questionable advantages Dr He says he was trying to provide through his tinkering—tinkering which was unsanctioned, illegal and which, since he went public, has seen opprobrium heaped upon him. The He affair could have taken place in many places, and it is hardly representative of the broad swathe of China’s researchers; 122 of them signed an open letter denouncing his actions. At the same time it is not at all surprising that the He affair took place in China. It was a perversion of what Chinese scientists are trying to achieve as they seek to establish themselves and their country in the world of elite science. But it was also an illustration of it. The Chinese government is aware of the risks of a reputation for poor and even fraudulent research. It is one of the reasons that it is orchestrating the development of a scientific establishment. One of its pillars is a core group of elite universities known as the C9. Fudan is one of them, as are Tsinghua and Peking Universities and Dr He’s alma mater, USTC. The other is the Chinese Academy of Sciences (CAS), an official agency that runs laboratories of its own, which will adhere to prevailing international standards. The government is clamping down on shoddy journals, especially those in which researchers pay to be published. Raising standards in this way will not just improve science; it will also attract the best scientists. After Deng Xiaoping came to power in 1978 the top tier of Chinese students was encouraged to go abroad for their graduate studies. Many returned, as had been intended, filled with knowledge unavailable at home. Without them the current scientific boom would not have happened, however much the government had spent. But the best often chose to stay abroad. In 2008 the country started the Thousand Talents programme to draw these exiles back with promises of lucre and lab space. In theory, the programme is open to any top-notch researcher working in an overseas laboratory, regardless of nationality. In practice, few non-Chinese have availed themselves of it. But many Chinese have. Such returners are known as haigui, the Chinese for “sea turtle”, since they are thought of as having come back to their natal beach, as turtles do, to lay their eggs. Talent that has not been abroad is not, however, neglected. A coeval programme, Changjiang Scholars, is aimed at identifying potential top-flight researchers who are languishing in thousands of provincial institutions. Once identified, they, too, are brought into the charmed circle. This is yielding results at all but the very highest levels. Chinese scientists working in China have as yet earned only one Nobel prize. Other than that work—the discovery of artemisinin, a novel antimalarial drug, by Tu Youyou—there has not yet been any Chinese scientific advance that a fair-minded person would be likely to think Nobel-worthy. No fundamental particle has been discovered there, nor any new class of astronomical object. Chinese scientists have not yet done anything to compare with, say, the development of CRISPR-Cas9 gene editing (America) or the creation of pluripotent stem cells (Japan) or the invention of DNA sequencing itself (Britain). But a great deal of Chinese science is now very good indeed, particularly in relatively new fields with practical implications. The country has a very large and ever growing workforce (see chart 3) that is both enjoined and keen to tackle juicy topics. A study published by Elsevier, a scientific publisher, and Nikkei, a Japanese news business, on January 6th found that China published more high-impact research papers than America did in 23 out of 30 hot research fields with clear technological applications. Chinese science is a nimble giant, capable of piling in on any new field of promise with enormous, often centrally encouraged, force. Developments in fields such as double-layer capacitors and biochar, two of those 23, may be important but are unlikely to be much noticed, either by Nobel committees, the public or foreigners who need impressing. 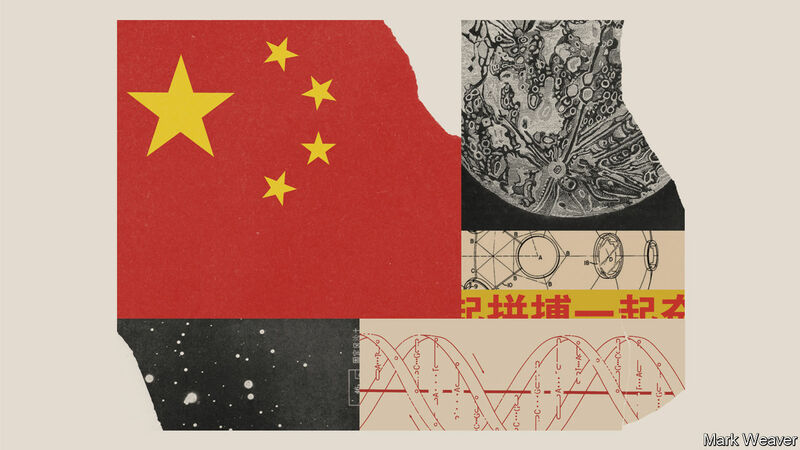 For visible signals of its national prowess, China is following the well-trodden path of big science in America, Europe and Japan: building large physics experiments and putting things—especially people—into space. The China National Space Administration has sent several “taikonauts” into orbit and provided them with some small space labs to hang around in while they are there. Its plans include, in the near term, a bigger space station, assembled in orbit from modules launched separately, and in the longer term crewed missions to the Moon enabled by a new booster more powerful than any of today’s, the Long March 9. The National Space Science Centre, part of CAS, is busy putting up scientific satellites; in April 2018 it announced six new ones that should be launched by 2020 or soon after. Most of China’s launches, though, are not scientific; they are for communications, Earth observation—and military intelligence. China’s space programme began in the bosom of the People’s Liberation Army (PLA), and though it is no longer directly run by the armed forces, they are still keenly involved with the development of the country’s orbital abilities. In 2007 China tested an anti-satellite weapon; its “Strategic Support Force” is thought to co-ordinate its military space-, electronic- and cyber-warfare capabilities. All China’s taikonauts are PLA officers. Other physics facilities have obvious military applications, too, such as wind tunnels designed for research into forms of hypersonic flight that are really relevant only to the armed forces. Beyond rocketry, China’s most ambitious big-science plan is to build the largest particle accelerator ever. Since their development in the 1930s, circular particle accelerators have grown from the size of a room to the size of the Large Hadron Collider (LHC), which occupies a 27km loop of tunnel beneath the Franco-Swiss border at CERN, Europe’s particle-physics laboratory. The bigger the accelerator, the more energy it can pump into its particles. The LHc packs its protons with more than a million times more energy than the original machines did in 1930s Berkeley. The Chinese plan foresees a loop of tunnel as much as 100km long. Even China will not be able to foot the bill for such a beast alone. In the 2000s the LHC cost CERN over SFr4bn ($5bn); contributions to its experiments from other countries, including China and America, significantly increased the total. Making use of it has cost billions more. Nor would China be able to supply all the physicists needed to make use of such a facility. Like the LHC, the next accelerator will be a single lab for the world, wherever it is: these toys are one-per-planet affairs. But the Chinese seem more serious than anyone else about hosting and building the thing. Just as it meant something beyond the world of particle physics when America cancelled its proposed giant SSC and CERN’s LHC became the biggest game in town, so it would mean something if China took CERN’s crown. Particle physics enjoys a particular prestige in part because of its early (and now dissolved) association with the development of nuclear weapons, in part because of the conceptual depths it plumbs, in part because of the sheer size and expense of its tools. But there are other parts of physics with more of the cutting edge about them. These include applications of the more abstruse aspects of quantum mechanics to computation and cryptography, an area where China is a world leader: it was the first country to send a quantum-encrypted message via a satellite. In computer science, too, it has few peers. Though it does not yet have a semiconductor industry that quite matches those elsewhere, it is world class in many applications, especially in artificial intelligence. The same applies in trendy bits of biology. Dr He was not the first person to edit the DNA of a human embryo. That honour belongs to Huang Junjiu, a researcher at Sun Yat-sen University, in Guangzhou, whose research was blameless and above-board. Like Dr He, Dr Huang was making use of the capabilities of CRISPR-Cas9. Since 2012 this form of gene editing has become one of the hottest fields in biology, and China is very well represented in it (see chart 4); according to the study by Elsevier and Nikkei, it is publishing 22.6% of the world’s most highly cited papers in gene editing, slightly more than half the amount that comes from America, and far more than from any other country. Dr Huang wants to apply CRISPR-Cas9 to the treatment of beta thalassemia, a hereditary blood disease. To this end, in 2015 he successfully edited the DNA of several fertilised human eggs left over from IVF treatment. He had no intention of implanting the results in anybody’s womb; he used embryos which, due to other abnormalities, were not able to develop. What he learned about gene editing in those experiments will, if all goes well, be used to edit stem-cells extracted from the bone marrow of people suffering from the disease, allowing them to make better red blood cells. Stem-cell research is another hot topic to which China is adding its heft. Zuo Wei of Tongji University in Shanghai is trying to use stem cells to repair lungs damaged by emphysema, a big problem in China, where smoking is still common and the air often dense with smog. Last year he conducted a trial in which four patients had some lung tissue removed. The most healthy-looking stem cells in that tissue were isolated and encouraged to multiply, and the revved-up results then sprayed back into the lung. The procedure apparently repaired the lungs of two of the patients; the other two showed neither benefits nor harm. Dr Zuo has since organised a second trial of 100 patients. He is working on a similar approach to kidney disease, but so far only in mice. Dr Zuo’s work demonstrates another feature of Chinese bioscience: keeping its application clearly in mind. In the West there has been an increasing concern over the past couple of decades that basic biology led by independent academic researchers has drifted too far from potential medical application. In America, in particular, biomedical-research prowess and the health of the population are increasingly poorly correlated. This concern has led to a new emphasis on building up “translational-medicine” research capacities to bridge the gap—an idea the Chinese are already integrating into their work. The government has opened a translational-medicine centre in Shanghai, where laboratory researchers, clinicians and patients will all be under the same roof and biotech companies encouraged to set up shop next door. Others may follow in Beijing, Chengdu and Xi’an. Genetic research is a field where China has both made big investments and sees a big future. In the BGI, as what was once the Beijing Genomics Institute is now known, China has by some measures the largest genome-sequencing centre in the world. Once an arm of CAS, it declared independence as a “citizen-managed, non-profit research institution” and has now become a semi-commercial chimera, with one of its divisions listed as a company on the Shenzhen stock exchange. The BGI’s corporate arm is also taking an interest in beta thalassemia; it has developed a DNA blood test for it, one of an increasing range it is making available across China. The tests use DNA-sequencing machines the BGI developed with technology which it acquired when it bought Complete Genomics, an American firm, in 2013. That battalion of machines has a lot of other work to do. Non-commercial bits of the BGI use them for pure research. The outfit is also home to the China National GeneBank, the intended repository for several hundred million samples taken from living creatures of all sorts, human and non-human. It already holds the genomes of 140,000 Chinese people, part of a wider desire by the government to be at the forefront of the field of precision medicine, in which diagnoses, and eventually treatments, are personalised with particular emphasis on understanding a patient’s genetic make-up. The BGI is one example of China’s ability to bring big-science approaches to new areas of research. For another you should look inside a low building in Zhuanghe, Liaoning province, where the world’s largest battery is taking shape. It is to have six times the storage capacity of the system supplied by Elon Musk, an American entrepreneur, to South Australia in 2017, which lashed together thousands of lithium-ion battery cells to make the world’s then-largest battery. It can do so because it uses a completely different approach based on a flow of vanadium-salt solutions. China’s near-insatiable demand for energy has led to investments in wind and solar power that dwarf those in other parts of the world, and is now leading to research into better ways of handling the energy they produce. Vanadium-flow batteries are of interest because, unlike most batteries, in which a single electrolyte is built into the cell, a flow battery has two electrolytes and an open cell through which they pass. This means its storage capacity is governed solely by the size of the tanks that store the electrolytes. That makes it possible, in theory, to build batteries big enough to store energy on a scale useful to large grids. The theory has been developed by Zhang Huamin, a researcher at the Dalian Institute of Chemical Physics, a local arm of CAS. The factory in Zhuanghe, owned by Dalian Rongke Power, a local electricity company, is trying to turn theory into practice. If it works, it could revolutionise grid-scale electricity storage. The Dalian Institute’s researchers are also looking into perovskites, materials with applications both in batteries and in solar cells. Their aim—also being pursued elsewhere in China and abroad—is to apply perovskite solutions to everyday solar cells so that the resultant layers will absorb wavelengths of light that the normal cells cannot absorb. This could produce much more efficient solar panels for relatively little extra cost. To the extent that academic publications are a good measure of technologies quite close to the market, perovskites are an area where China has a substantial lead over America, with 41.4% of the highest impact publications, compared with 21.5% from America. China’s energy research also extends to areas that the rest of the world is avoiding. China is building 13 new nuclear reactors to add to its fleet of 45; it has 43 more planned. If they are all built China will become the world’s biggest generator of nuclear electricity. Those reactors are of similar design to the plants already in operation around the world. But China is also exploring new reactor technologies—or rather, technologies abandoned elsewhere. These include reactors in which the core is filled not with fuel rods but with little ceramic pebbles—or, in the case of thorium reactors, with molten metal. The lack of progress such reactors have enjoyed in the West reflects a lack of appetite for new sorts of nuclear power much more than a lack of scientific plausibility. If China’s appetite is sharp and its researchers imaginative, progress may come swiftly. The development of mass-produced, compact, cheap and safe nuclear reactors would be a Chinese first that a world in the throes of climate change would have real cause to celelebrate—and start importing. That possibility, though, brings to the fore a shadow over the future of Chinese science. Making novel nuclear reactors extremely safe requires critical thinking and obstinate truth-telling; so does convincing others that you have done so. A culture that provides the results the boss wants, or does not investigate inconvenient anomalies, or withholds data from nosy outsiders is not good enough. Those requirements are very like the norms that are seen as basic to doing good science in the West. Testing hypotheses, finding the flaws in the work on which your teacher’s reputation rests, questioning your own assumptions, following the data wherever they lead, sharing data openly with your rivals-sorry-colleagues: this is how science is meant to work, even if in real life the ideal can be a bit tarnished. In some labs and institutions in China things doubtless do work that way. But the authoritarian system in which they are embedded makes it hard for Chinese science to speak truth to power, or escape challenges to its integrity. This gnaws at the scientific body politic, and saps resources, both financial and moral. In matters of promotion, job interviews and grant-giving, the question of who you know seems much more important in China than in the West (and even there, it is not negligible). For the past decade the National Natural Science Foundation of China (NNSFC), one of the country’s main funding bodies, has been running a campaign against such misconduct. Wei Yang, until recently the NNSFC’s boss, describes a situation in which, to stop interference from outside, the composition of interview panels is kept secret until the last minute. Panellists are not told in advance who candidates are, and both panellists and candidates have their mobile phones confiscated in order to avoid anyone being nobbled—which used to happen even while interviews were being conducted. Some Chinese scientists fear that the corruptions and silences endemic in authoritarian states will hold them back from the breakthrough-making Nobel-winning heights. Others may doubt this. China has been playing in science’s premier league for only a decade or so. Its investments are not at an end. China’s R&D was 2.07% of GDP in 2015, up from 0.89% in 2000 (see chart 5). That is higher than the average for European states, but lower than France, Germany or America. It is much lower than in the Asian catch-up states that might be the most natural comparators, Japan and South Korea. A China spending as much of its GDP on research as South Korea does would have an R&D budget twice today’s. With resources on that scale and a scientific workforce in the many millions, the hobbling effect of corrupt institutions might be overcome by brute force. Others might argue that big breakthroughs are not the only measure of good science. Incremental work that solves practical problems is not to be sniffed at. Scientific research directed from the top down can serve national goals, and a one-party system may give particularly consistent support to such programmes. China’s lunar programme has built up its capabilities steadily in a way no Western space-science programme has since Apollo, the achievements of which it may yet match. This is the sort of methodical science that typically appeals to engineers oriented towards results—and from Jiang Zemin onwards all China’s presidents, as well as almost all its other leading politicians, have had engineering degrees. Xi Jinping, today’s president, studied chemical engineering at Tsinghua. But the idea that you can get either truly reliable science or truly great science in a political system that depends on a culture of unappealable authority is, as yet, unproven. Perhaps you can. Perhaps you cannot. And perhaps, in trying to do so, you will discover new ways of thinking as well as fruitful knowledge. It’s been 226 years since the British Empire dispatched its first diplomatic representative to China. Arriving in Peking in 1793, Lord George Macartney asked the Qing ruler of the time, the Qianlong Emperor, to allow a permanent British diplomatic residence in the capital, and more important, to open new ports for international trade and negotiate an equitable tariff regime. Lord Macartney’s requests fell on deaf ears. He was dismissed with little more than a note from the Qianlong Emperor addressed to King George III that said the British requests were “not in harmony with the regulations of the Celestial Empire.” The British avenged this slight 49 years later when they forced the Daoguang Emperor to sign the Treaty of Nanking practically at gunpoint. The easy British victory in what would become known as the First Opium War was a turning point in Chinese history, paving the way for the Qing dynasty’s collapse, a bloody civil war, the rise of Mao and the Communists. This Deep Dive takes a look at the influence of the conflict on these events – and on China’s current trade spat with the United States. In the early 19th century, China existed in a kind of isolation that would be almost impossible in today’s globalized world. That’s not to say China was sealed off from global affairs. European traders had begun using their advances in maritime technology to increase trade with China since the early 17th century, and in 1685, the Kangxi Emperor had even granted foreign merchants permission to trade at four Chinese ports – China’s original special economic zones. But by and large, China was an inward-looking country. When the First Opium War began in 1839, it didn’t even have a Ministry of Foreign Affairs (or an equivalent office, for that matter). Indeed, China had no such ministry until the beginning of the 20th century, and even then its creation was due to foreign demand, not imperial desire. China didn’t join the world so much as the world forced itself on China. No foreign power played a bigger role in accessing China’s immense economic potential than the British Empire. And it all began for a rather innocuous reason: the British affinity for tea. There were of course other goods that Europeans wanted from China, including silk and porcelain. Still, what began as a curiosity for well-to-do British subjects in the 1600s became a national obsession in the next century. By the early 1700s, cheaper transportation and climbing British demand made tea one of Great Britain’s fastest-growing imports. Great Britain was importing roughly 32.5 tons (about 29.5 metric tons) of tea annually at that time, but by 1750, its tea imports had swelled to an average 1,250 tons each year. Tea represented a full quarter of the English East India Company’s imports by value in 1758, up from just 0.6 percent in 1668. But China didn’t reciprocate the exploding Western demand for its products. The Chinese had comparatively little desire for Western exports like cotton, wool and manufactured goods. The result was a trade imbalance, and a balance of payments problem for Western nations. In the 18th century, Westerners paid for Chinese goods primarily in silver. Capital inflows to China in terms of silver increased by a factor of five between 1760 and 1780 alone. For the British Empire, which relied on the strength of the pound sterling for its economic power, the situation was especially disadvantageous. Britain’s overall trade balance was positive between 1772 and 1775, at roughly 361,000 pounds. Between 1784 and 1792, however, its trade balance had turned negative, a deficit of 1 million pounds – a trend that deepened, hitting a 3.7 million pound deficit about a decade later, just as Britain was taking on debt to fight the Napoleonic Wars. Britain’s solution to this problem was opium. Opium turned out to be something that grew quite well in northern India, which the British Empire had conquered in the latter half of the 18th century, and something the Chinese did want to buy. As it exported more opium, Britain, in effect, got back much of the silver it sent to China to cover the cost of its tea, silk and porcelain habit. The trading relationship was slightly more elegant than this, of course: A so-called “triangular trade” emerged, whose specifics, though interesting, are for our purposes superfluous. Suffice it to say that the British Empire had found a way to correct its trade imbalance. Britain’s opium exports to China climbed steadily from about 200 chests (the equivalent of 130-160 pounds) in 1729 to 23,570 chests in 1832 of opium and to well over 40,000 chests in 1838, on the eve of the First Opium War. As demand for opium surged in China, the country’s leaders proved powerless against the drug and its purveyors. The Qing government tried to curb opium abuse, banning imports and domestic production of the drug by imperial edict in 1800, to no avail. The British simply smuggled it in, with the help of locals. An edict in 1813 outlawing the practice of smoking opium was met with similar results. The Daoguang Emperor made a last-ditch effort to deal with the crisis in 1838: He appointed a special commissioner empowered to stop the opium trade for once and for all. The next year, the commissioner arrested a British opium trader and then confiscated and destroyed 20,000 chests of opium – about half that year’s anticipated exports. Great Britain had its casus belli. By 1840, a British fleet had arrived to bring the Qing to heel. The resulting Treaty of Nanking opened China up, and not just to Great Britain. France, Germany, the United States and Russia all would eventually demand similar treatment, and, at various intervals in the ensuing century, each would intervene whenever it wanted to change the terms of its original agreement – or, in the case of Russia and Japan, to conquer Chinese territory. The issue was more than a matter of the power these more advanced industrialized nations had relative to China. The First Opium War was one of many signs that the Qing dynasty, now approaching the end of its second century in power, was losing control over its domain. In that sense, the opium trade and the war it sparked exacerbated a problem that was already there. One of the major domestic byproducts of the opium trade was that it turned inland Chinese regions against the power centers on the coast. Chinese peasants used copper as currency in their everyday transactions, though the government required that they pay taxes in silver. As silver outflows increased – reaching 2 million taels by 1820 and 9 million by the 1830s – the price of silver increased relative to copper. The same Chinese government that was proving impotent at protecting its people from foreign invaders was also taking more of their money to do it. Over the century or so after the First Opium War, China lived through one of the bloodiest and darkest chapters in its history. The Taiping Rebellion, the Second Opium War and the Boxer Rebellion all unfolded in rapid succession, crippling any chance the Qing had at remaining in power. First Russia and then Japan conquered large parts of China. (Japanese rule on the mainland would be particularly violent and cruel.) But the Chinese people didn’t present a united front against their foreign enemies; as in previous periods of China’s history, warlords sprang up in different regions, with corruption and exploitation masquerading as local government. The two most powerful of these warlords – Chiang Kai-shek and Mao Zedong, Chinese nationalists of profoundly different ideological views – fought each other even as the Japanese ravaged their country. And while most of the world breathed a sigh of relief at the end of World War II, Chiang and Mao battled for control of China, a struggle Mao won in large measure because he represented a break from the past, a leader who gave China its best chance to fend off the depredations of its enemies. The Communist Party of China inherited the national memory of the First Opium War and the humiliations that followed. And under the party’s rule, China has gone from a hulking, sclerotic, broken hellscape to a strong, reunified country brimming with pride for what its future may hold. When President Xi Jinping refers to his dream of completing China’s national rejuvenation, he is talking about a very real sentiment, a sentiment that has given and continues to give the CPC more legitimacy than the party’s token embrace of Marxist thought and policies. The moment this Chinese government looks weak, or as if it’s succumbing to the same impotence of previous dynasties, it risks losing the loyalty of the people, for whom its repressiveness is a small price to pay to keep China independent and unified. From this standpoint, the current trade war with the United States is one of the gravest tests the CPC has faced during its tenure. When he came to power, Mao closed China off from the world, much as the 17th-century Kangxi Emperor had done as he completed the Qing conquest of the country, to consolidate the CPC’s rule. It was only after Mao’s death that a new generation of Chinese leaders felt confident enough in the political system’s stability – and desperate enough to bring prosperity to the people – that China opened itself back up. The opening happened far more on China’s own terms than its previous experience integrating into the global trading system did. And it had for a partner in this endeavor a United States that was more concerned with isolating and defeating the Soviet Union than it was with maximizing profits. Had there been no Cold War, it is doubtful that the United States and China would have entered into a symbiotic relationship in the 1970s. The mutual fear of Soviet intentions gave both sides an impetus to forge a tighter relationship. It took more than a decade after President Richard Nixon’s trip to China in 1972 for the economic ramifications of the U.S.-China entente to become apparent. By 1985, though, it was becoming clear that the global economic system had shifted and that China and the United States were to be its new twin pillars. China’s key resource was its massive population. What before had always been a curse now enabled China to produce consumer goods more cheaply than any other country in the world. The United States, meanwhile, derived its power less from making things that other countries wanted to buy than from the size of its consumer market. The arrangement wiped out entire industries in the United States, and millions of Americans lost their jobs to cheaper Chinese labor, but the flip side was that U.S. consumers got to enjoy cheaper goods. Cheap Chinese steel meant cars could be made for less. Low Chinese overhead meant the prices of clothes, shoes and furniture were all held artificially low. Eventually, Chinese factories would start making electronics cheaper too. It’s doubtful the average American consumer today could afford a smartphone were they not produced partly in China. And yet, as it did for the British Empire, a trade imbalance emerged. In 1985, the U.S.-China trade was practically balanced. But since then, the United States has run a trade deficit with China that in 2018 reached $344 billion – nearly 15 times what the total U.S. trade deficit was in 1982. China’s trade surplus, on the other hand, has skyrocketed from $4.7 billion in 1982 to $237 billion in 2017. (As a percent of China’s GDP, the surplus has actually declined, but it is still at 2 percent.) It would be inaccurate to call this a redistribution of wealth because, despite some negative effects, the United States has profited greatly from China’s role as the low-cost factory of the world. Instead it’s more that the U.S. and China aligned their economies for their mutual Benefit. Now the primary issue is that both countries have reached the limits of this alignment. The wealthier and more successful China becomes, the more it has to pay its workers, dulling the edge that was its cheap labor force. For the United States, likewise, the rising cost of goods and the growth of global demand, which is showing signs of outpacing production, is souring the deal somewhat – even at the top of one of the longest expansionary economic cycles in U.S. history. What once was a symbiotic relationship between the U.S. and China has become irrational. The countries, moreover, have developed unhealthy borrowing habits over the course of their economic arrangement. Chinese companies have gone into debt to pay workers even when the profits don’t justify the payments. U.S. consumers have gone into debt to buy houses and cars and to meet the rising costs of education. The 2008 financial crisis was the first wake-up call that something was really wrong here, but the U.S. and China have continued with business as usual, amplifying the system’s inherent irrationality. One possible solution is for China to become a consumer in its own right and leave the low-cost manufacturing to other developing countries. It’s a shift many export-producing countries before it have made after a period of preternatural growth. Furthermore, it could help solve one of the main problems in today’s global economy: uncertainty about where demand growth will come from. China, with its more than 1 billion people, is an attractive target for multinational companies – especially U.S. companies, such as Apple, Boeing and Starbucks, that bet they would reap major gains from selling to the Chinese market. Herein lies the crux of the U.S.-China trade war, and its resemblance to the First Opium Wars. When the British sent their first diplomatic mission to Peking in 1793, they wanted China to trade on their terms: to open up its markets, agree on a new tariff regime, and do away with its stifling and hierarchical trading system. When China refused, Britain turned first to an economic lever – the opium trade – and then to brute force. Like the British Empire in the late 18th century, the United States today wants a new economic relationship with China. It wants China to keep opening up its economy by agreeing to intellectual property standards. It wants assurances that U.S. and multinational companies can operate in China without fear of sudden nationalizations or regulations requiring them to make anything other than profit their fundamental goal (a big ask for the Chinese government, considering its economic policies even now put social stability before profit). It wants China to recognize that it has benefited from its economic relationship with the United States and let the U.S. modify that relationship in a way that will best meet its current needs – primarily new markets for American companies. Washington cannot achieve these goals through brute force. China is a significant regional power with significant economic and military resources, and, anyway, the age of imperialism and mercantilism has passed. The Obama administration tried to achieve these objectives with the Trans-Pacific Partnership and the use of precision tariffs. The Trump administration has opted for a more combative approach and a suite of less subtle tools. But beneath the bravado, the goal is fundamentally the same. China, understandably, is resisting this approach. Since Xi became president, “self-reliance” has become one of his common refrains; he would rather Chinese companies be the ones selling to the burgeoning Chinese market – that they move up the value-added chain and become the springboard for another great leap of prosperity for China’s people. From the Chinese perspective, the world has profited enough from its factory workers’ labor in obscene conditions, from the pollution its companies have inflicted on the Chinese mainland to work quicker and cheaper than their foreign competitors. China also sees that for nearly a century, Western powers have gained from its internal weakness and that a large part of the reason it decided to pursue the glory of enrichment was to take the next step in its national development as a power, not necessarily with global ambitions, but with the ability to defend its national security interests from would-be bullies. China doesn’t want to play by the rules anymore. It wants to have a hand in making the rules, and it wants those rules to benefit it, not just other countries. Yet the People’s Republic of China, though significantly stronger than the Qing dynasty was in 1839, is still weak compared with the rival making demands of it. If China closes itself off from the global system, the domestic economic consequences might spark a revolution. If it integrates more into the global system on the United States’ terms, however, it might push the public one step closer to disillusionment with a government that is both repressive and incapable of defending China’s interests. There are no good choices for China right now. The strategies Beijing talks about using to increase its power – the Belt and Road Initiative and innovative technologies such as artificial intelligence – are at best long-term dreams and at worst empty public relations campaigns. They do nothing to help China with what it’s facing here and now: a stronger Western power dissatisfied with the current state of trade relations. That puts China in a difficult, if familiar, situation. Despite the historical echoes in the present day, it’s important not to carry the Opium Wars analogy too far. China today is a vastly different country from the China of the 19th century. For one thing, the Qing dynasty was itself a foreign usurper; when Mao brought the CPC to power, he also brought the ethnic Han population back to power. China is still a diverse country, but the vast majority of its population, and the ruling elite, is Han Chinese. (Under the Qing dynasty, the Han population could overlook the disconnect they felt with their minority Manchu rulers so long as the government was strong, silver was flowing into the country and all was going well.) The Han identity of its leaders gives the CPC another crutch to lean on: the powerful force of nationalism. Throughout his tenure, Xi has sought to reinvigorate the Communist Party’s legitimacy by emphasizing nationalism and Marxism, in addition to ruthlessly weeding out corruption – a necessary ideological shift since, even in the best-case scenario, without a difficult trade negotiation hanging over its head, China’s economy would struggle with the shift from an export-based model to a consumption-based one. Furthermore, the CPC dynasty is fairly young, and it has yet to show that it is losing control over China. If anything, it is demonstrating precisely the opposite with the imposition of a dictatorship, the forced re-education of ethnic Uighurs, the jailing of dissidents and corrupt officials, and ambitious plans to use technology to monitor every facet of Chinese society. When the Qing dynasty faced crisis with Great Britain, it was losing control – of business interests in the south, of peasants in the interior, of the vast bureaucracy that had governed China for centuries and had not modernized as other major powers had. The CPC today does not appear to be losing its grip on the country in the same way. Xi has so far managed to identify and eliminate the opposition; the People’s Liberation Army has undergone massive reforms, and, aside from the occasional veterans’ protest, seems no worse for the wear. Very few Chinese dynasties have crumbled within a century, and the CPC is only in its 70th year. If history is any indication, decades of disillusionment and unrest would prefigure the party’s unraveling. A case in point is the fast and formidable development of China’s military forces in recent decades. China also tried to modernize its military at the start of the First Opium War. When the British defeated the Chinese in 1842, they found evidence – including a nearly completed replica of a British warship and sophisticated ship guns – that the Qing were already copying their technology. The Qing simply didn’t have the time or power to respond quickly enough, nor was the decaying structure of a decidedly feudal and anti-modern imperium suited to such hairpin turns. The People’s Republic of China, by contrast, has the control, the money and the motivation to follow through more effectively. China’s military forces still pale in comparison with those of the United States, but, even so, its recent progress is hard to ignore. China, for its faults as well as its virtues, is a 21st-century country in a 21st-century world. At the time of the Opium Wars, it was a 16th-century country in a 19th-century world. But China is no longer a backwater. The China that the British, French, Portuguese and Americans encountered was one that believed it was the center of the universe. Part of that ethos came from the fact that China was self-sufficient in all the things it needed. The self-sufficiency was in part responsible for the trade imbalance that set off the Opium Wars in the first place: The Chinese people didn’t feel the need to import fancy European objects. A few centuries later, China no longer harbors delusions of itself as the “Celestial Kingdom.” And it isn’t self-sufficient anymore, at even the most basic level: It imports food and oil, and estimates project that those imports will only grow going forward. Japan was aggressive and expansionist in the 20th century because its national survival depended on it being an outward-facing power. That has never been true of China until now. The shift might serve to accelerate China’s internal fracturing – or it may provide the basis for a much stronger Chinese foreign policy going forward. The First Opium War was a seminal moment in Chinese history. It proved the weakness of the Qing dynasty to China’s enemies and to its own people. For 100 years after the Treaty of Nanking, foreigners defined Chinese economic and foreign policy. Even after the Communists came to power, China’s position on the international stage was a choice between isolation and accepting Western rules to enjoy the benefits of the global economy. Led by the United States, the West once again wants to deal with China on new terms of its choosing, and China is caught between being too weak to resist and too painfully aware of its past to comply. In that limited sense, the situation today resembles previous moments in history, all of which ended in an eventual military confrontation that yielded a Chinese defeat. It is premature to think in these terms – but it is irresponsible not to put the latest confrontation between East and West in its appropriate historical context. The most often-heard argument against a second vote on British membership of the EU is also the least plausible. By this account, revisiting the issue would be “divisive”. Old wounds would never close. Deal or no deal with Brussels, the sooner the barricades are thrown up across the Channel the sooner a spirit of national unity can be restored. This relies on the outlandish assumption that the 48 per cent of Brits who voted in 2016 to remain part of the EU are now content to hum the English nationalists’ tunes. Those who saw the country’s fortunes as inextricably bound up with Europe are ready to shrug their shoulders at the prospect of a poorer, less secure, closed Britain. In the real world, revisiting the decision taken in 2016 would be divisive only in the sense that the Brexit vote was itself divisive. Plebiscites are exercises not in democracy but in crude majoritarianism. The institutions and norms of liberal democracy are there to protect the rights of minorities. Referendums afford no such respect to the loser. In two of the nations of the union that comprises the United Kingdom — England and Wales — a majority backed leaving the EU. In Scotland and Northern Ireland the greater number wanted to remain. Opinion across all four nations was divided around just about every demographic axis. England’s great metropolitan cities — London most notably — produced big pro-European majorities. They were outvoted in provincial cities and towns and rural areas. Across Britain, young people backed staying in the EU by a hefty margin — only to see a different course set for their lives by those whose futures are mostly behind them. The university-educated affluent were solidly Remain. The less advantaged mostly joined the Leave camp. Two-and-a-half years after the referendum the chasm looks, if anything, deeper. Traditional left/right divides have been rubbed out by the Brexit faultline. Opinion pollsters say the numbers suggest that a second referendum most likely would see a shift just sufficient to produce a Remain vote. Brexiters warn in one breath that a second referendum would be dangerously divisive and in the next claim, curiously, that it would hand them a landslide. A dispassionate view would probably judge the outcome too close to call. It is safe to say that, whatever the fortunes of prime minister Theresa May’s Brexit deal when parliament votes on the package next week, the costs and consequences of leaving the EU will be felt and fought over for years to come. Brexit is a process, not an event. Untangling the closely woven threads of integration will be not be easy. The arguments could rage for a decade. Along the way the young will not be applauding the old for denying them a future in Europe. More likely the fractures will widen. The UK union is the likely victim. When the people of Scotland voted in 2014 against separation, they were opting for an open over a closed future. Scotland’s unique ties with the other three nations of the UK sat alongside Britain’s place in the EU. Brexit changes fundamentally this calculus. For all the nonsense spouted by some Brexiters about “Global Britain”, the road out of Europe leads back to little England. What else does “taking back control” of borders mean except closing the door to outsiders? Leaving the single market and customs union is an act of protectionism. It will restrict exchanges — personal as well as economic and political — between Britain and its neighbours. 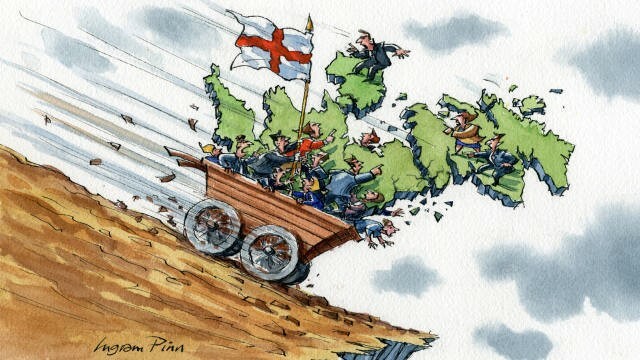 At its root, Brexit is an expression of English nationalism — a rejection of “Britishness”, the ingeniously expansive identity invented to embrace UK union and empire. The next time they are given the chance, the people of Scotland will surely choose Europe over England. Northern Ireland’s place in the union is no longer beyond question. For the moment Mrs May depends for her majority at Westminster on the votes of the Democratic Unionist party. But the implacable stance on the Irish border that has seen the DUP hold the prime minister to ransom in the Brexit negotiations also marks out the distance between unflinching Ulster unionism and broader opinion in Northern Ireland. Demography is on the side of those seeking a united Ireland. Brexit pushes in the same direction. It is too soon to say what parliament will come up with if, as expected, Mrs May’s deeply flawed Brexit blueprint falls to heavy defeat next week. Nothing can be ruled out in a nation suffering what can only be described as a collective nervous breakdown. Hardline Brexiters call themselves champions of parliamentary sovereignty. Yet they rail against John Bercow, the Speaker of the House of Commons, for giving MPs the opportunity to exercise that sovereignty. These Brexiters also whisper that “the people” (they mean angry nationalists who have been trying to intimidate pro-European MPs) will take over the streets if the MPs dare to challenge the outcome of the 2016 referendum. When last did the House of Commons bow to fear of the mob? This is what happens when parliamentary democracy falls victim to a demagoguery that decrees that once voters have taken the “right” decision they cannot change their minds. It would be naive to think that a second referendum would close all the fissures opened up by Brexit. It might save the UK from the break-up of the union.